My kids love to try new things. So, it was no surprise to me that as soon as my husband picked up a container of Silk Fruit & Protein that they would be all over trying it. They both really enjoyed it. My daughter started requesting it as fruit milk. I thought this was a great way to look at it. She saw it as the same as having 'strawberry milk', but I knew that she was getting a little more out of it than just that. Silk Fruit & Protein is a Good Source of Protein, and an Excellent Source of Calcium, Vitamin D and Vitamin C. We tried the Mixed Berry and each 1 cup serving of Mixed Berry is packed with 5 grams of Protein, 100% Vitamin C, 20% Calcium and 25% Vitamin D.
For those with allergies, it is good to note that according to the package, the product is free of lactose, dairy, cholesterol, eggs, casein, MSG and worries....this message is sandwiched between "It's Free" and "You still have to pay for it", which I found to be cute and caused a light chuckle when I read it. Of course, it's protein source is from soy, so if you are allergic to that, well, it's not a good option. 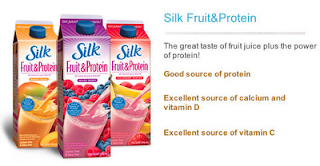 "Silk Fruit & Protein: The great taste of fruit juice plus the power of protein." As I noted, we tried the Mixed Berry, but Silk Fruit & Protein is also available in Strawberry Banana and Mango Peach. To me, the Mixed Berry delivery felt a bit like a drinking yogurt. It was smooth and creamy with a nice fruit flavor. I can't wait to try the other flavors, which I consider more 'breakfast juice' like and see if their delivery feels more like a juice or a drinking yogurt. My kids have been pretty entertaining. One night at dinner, I asked, what do you like about the product. My daughter started off talking about the fruit flavor of the fruit milk and wound up sounding a bit like a commercial, even ending her comment with a 'so go buy it now!' When we laughed and commented that she sounded like a commercial, my son decided that he was going to write a commercial and include all of the Silk products in our refrigerator. He asked my husband if he would film them, which of course he said that he would. The next morning, I came into the kitchen to see four 1/2 gallons sitting on my counter while he was busy writing down the flavors (Vanilla Coconut Milk, Vanilla Almond Milk and Dark Chocolate Almond Milk, in addition to the Fruit & Protein). I have yet to see the script or the commercial, but I can't wait. It's funny how once you try a new product you have a tendency to share it with friends and/or suddenly know who would love/use this product. I was walking with a friend one day and she was mentioning that she worries about her daughter getting enough protein, because she is not a big meat eater. I suggested that she might try the Silk Fruit & Protein as a drink at meals to increase protein intake easily. Another friend has a daughter that is allergic to milk. I haven't had a chance to talk to her since we tried it, but I have a couple coupons ready to share, because I think this would be a great alternative for her and allow her to get some extra calcium too. Want to learn more? You can find out more by checking out the product pages for each flavor: Silk Fruit&Protein Mango Peach, Silk Fruit&Protein Mixed Berry, and Silk Fruit&Protein Strawberry Banana. You can read about the Silk Love It Guarantee, check out other reviews on their Facebook page. Now through March 28th, you can enter the Product Giveaway on Facebook, where they are selecting 60 people per day to try the New Silk Fruit & Protein for Free. Get $1 off - you can find a printable coupon for $1 off Silk Fruit & Protein on the Silk Fruit&Protein website. Courtesy of Silk, I have the opportunity to giveaway to one A Busy Mom of Two reader a set of coupons to try each flavor (3 Free coupons, plus several $1 coupons to share or use) of the new Silk Fruit & Protein. Giveaway will remain open through April 5th. Giveaway is open to residents of the US only. One winner will be selected through Rafflecopter. The winner will have 48 hours to respond or a new winner will be selected. No compensation was received for this post. All opinions expressed are my own or that of my family. I was provided with 3 coupon envelopes, so that my family could try Silk Fruit and Protein, and information about the product from Silk. My favorite juice blend is Cranberry and Raspberry. I'd like to try the Silk Fruit&Protein Strawberry Banana first. I like cranberry/cherry blend normally, so I'd like to try the Mixed Berry.